Home > Blog > How Does Phentermine Suppress My Appetite? How Does Phentermine Suppress My Appetite? Phentermine causes the brain to stimulate the adrenal glands to release neurotransmitters which signal a fight-or-flight response, similar to the reaction of our bodies when we are faced with dangerous or exhilarating situations. By releasing the neurotransmitters norepinephrine, serotonin and dopamine, phentermine produces a satiating effect, increasing feelings of fullness, minimizing hunger, and reducing cravings. The appetite-suppressing effects of phentermine are usually strongest at the start of your prescription and can range from completely losing your appetite to slight appetite suppression, but often also includes feeling full much quicker than you would normally. However, phentermine should not cause food to taste different or become unappealing. If food tastes different this is likely to be as a result of dry mouth, so to combat this side effect and soothe your dry mouth, while making sure you keep hydrated with plenty of liquids, we recommend the new product Phen Drink. Phen Drink is a soluble powder which is easily added to water to combat the extremely common dry mouth side effect. 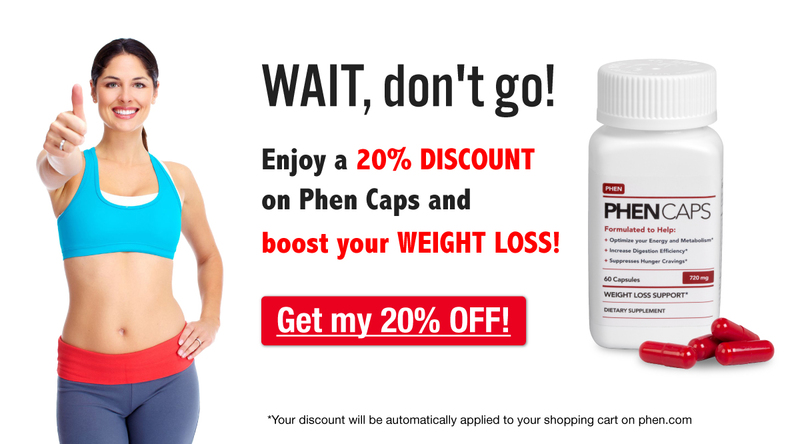 Phen Drink also contains ingredients which actually help to boost your weight loss potential by increasing metabolism and adding to the appetite-suppressing effects of phentermine, meaning that with the help of Phen Drink, your eight glasses of water a day will be working even harder to help you succeed on your weight loss journey. For many people, establishing more control over appetite and cravings holds the key to weight loss. This is because those who have tried and failed to lose weight by diet and exercise alone often struggle with problems related to appetite cues, satiety regulation and cravings related to food addictions and emotional issues. While it is debatable whether this problem originates as a result of genes, psychological issues, or is due to many years of eating badly, the fact remains that by manipulating neurotransmitters to control satiety cues, phentermine can successfully help obese patients regain control of their eating for what may be the first time ever. With a reduced appetite, you should still experience feelings of hunger, but one that is satisfied with fewer calories than you would have typically needed prior to taking phentermine. Most doctors and weight loss experts agree that a minimum of 1,200 calories should be consumed each day, but that this daily allowance could be set higher, depending on the patient’s start weight and loss required to reach a healthy BMI and body fat content. It is then up to you, with help and advice from your phentermine doctor, to make the right choices when it comes to establishing a healthier diet comprised of a variety of nutritious foods which also work to keep hunger at bay, such as fiber, protein and healthy fats. The appetite reduction phentermine provides also gives you the focus necessary to change eating habits without distraction from misplaced hunger cues and cravings, so that you can eat the right foods in order to provide your body with the nutrients and vitamins required for good health and weight loss. Due to individual differences, those taking phentermine can report many degrees of appetite suppression; while some people will report not feeling any different, others find that the appetite suppression is so strong that they can barely eat. While it may seem that struggling to eat anything is a good thing if you’re trying to lose weight, as with most things in life, balance is essential when it comes to appetite, and neither too much nor too little is a good thing. With no appetite, you will be unable to eat enough to keep your metabolism running at a fast enough rate, and without the fuel it needs, your body will slow down, meaning that any food you do eat will not be turned into energy as efficiently by your body, resulting in slower weight loss. Even if you do manage to successfully lose weight on phentermine while eating very little, when your prescription comes to an end you will regain your appetite and, without having learned healthy eating habits, you are most likely to regain the weight you lost as well. If you’re just starting on phentermine and have little to no appetite then it may be that your appetite will become more balanced within a few days. However, if this effect continues and you’re finding it difficult to eat anything, then we would recommend that you consult your doctor to make sure that your dosage isn’t too strong for you. If you’re eating fewer calories than the minimum 1,200 recommended by many health and weight loss experts, then it is also likely that you might not be consuming enough food to obtain sufficient quantities of essential vitamins and minerals. To help ensure that you meet your daily requirements for nutrients while dieting, we recommend Phen Vites, a multivitamin specially aimed at those taking phentermine to ensure that you feel great while you’re losing weight. As well as many essential vitamins often found lacking in the typical American diet, such as magnesium, folate, and vitamins A, C, and E, Phen Vites also contain weight-loss boosting ingredients such as vitamin B12 and 5-HTP to help you make the most of your phentermine prescription. If, on the other hand, phentermine isn’t suppressing your appetite as much as you’d hoped, then these tips on how to suppress your appetite offer you some great ways to make sure that you’re able to beat your hunger and concentrate on establishing a healthy way of eating. A great way to boost the appetite-suppressing effects of phentermine is to combine your prescription with the weight loss supplement Phen Caps, which can also be taken on their own after your phentermine prescription ends to help you continue with your weight loss journey if you still have more weight to lose and want to benefit from continued appetite-suppression. How does phentermine affect your appetite? Let us know by commenting below! I have been on Phentermine for ten days, and the side effects are a bit different the tingling, and the high energy lasted for two day with slight headache. Then settled, to experiencing for the last few days being edgy and slight headache with dry mouth; no appetite at all, not having and appetite has been great but I have not seen a great weight loss, so I am trying to make sure to go to grocery store for healthy choices. I do take levthyroxine 75 I am wondering would this be combination of the two together? My friends are concerned with my not bad but edginess. Please share thoughts with me on this Thank you. Hi, I have been taking phentermine for a week today and the first three days I took it I had no appetite at all – I never once felt hungry so I didn’t eat, I have much more energy and I feel more awake. I have not changed my diet or exercise and I weighed myself today and I have already lost 10 pounds exactly I am so happy. But I found to that with this medication about an hour after I take it I get extremely light headed for about 5 mins then I am fine all day. This medication has changed my life so much already I am so happy to finally see the weight and inches falling off. Next week I start a new exercise with this and hopefully I will keep seeing the weight come off. Good luck to everyone on phentermine, it works for me I hope it will do the same for you. That’s great news, and we’re so pleased to hear you sounding so positive! We’re happy to hear that you’re starting exercise next week too, as this is often the key to keeping the weight off long term. With the light-headedness, as you know when it’s coming, just take some time to sit down and drink some water and you should be fine – this effect should also wear off within the next few weeks. Good luck! Prior to six months ago, I was working out regularly and eating healthy. At that time, my job was very busy and I was walking anywhere from 5-7 miles per shift, 3 days per week. I switched six months ago to a job where I’m lucky to get in a measly mile per day, plus I’m working 5 days, and about 50-55 hrs per week. Once I get home, I’m taxi driver for my kids 3 days per week for 2-3 hours gone away from home at my kids activities. My husband works opposite shift. I’ve gained 25lbs since starting this job and have zero energy to even do stretches. All my labs, ECG came back normal. I am an emotional eater; I eat out of boredom and stress. I’m in the process of going back to my old job, but it’s going to take some time. In the meantime, my doc said Adipex will help me lose enough weight to regain enough energy to get back into healthy habits while trying to get back into my old job or something less stressful. I’ve never taken anything other than an antibiotic as a prescription, so I’m really nervous about taking this. I took only half today and I’m thinking I will only take half for a couple of weeks, work my way up to a whole dose, take whole dose for a few weeks, and during the last week of taking whole dose, start exercise routine again and begin to taper my doses to avoid withdrawal with weight gain. What do you think? Taking a half dosage and working your way up is a good idea, as well as tapering your dosage towards the end to avoid withdrawal. However, you should be exercising now to make the most of the energy boost that phentermine is giving you. I realize you work long hours but putting off starting exercise will mean that you won’t get as much out of the phentermine as you could – if ten minutes a day is all you can manage then do that – something is always better than nothing. Good luck! I\’ve been on phentermine for 4 days now and I be feeling like I\’m full but I still managed to eat a bite of something around lunch and if I\’m too full for dinner I might skip out or I\’ll leave the lunch alone and do dinner. I be feeling dizzy a little bit but I be okay after a while, we all here just might have to give it some time for it to settle and adjust to our system. I\’m praying that it helps with my weight loss . Hi Rosalyn, thanks for your comment! The appetite suppression is usually strongest in the beginning, so your appetite will probably get a little bit stronger as time goes on. Still, take care to eat enough now (at least around 1200 calories per day) so that your body has the fuel it needs to function and burn fat efficiently. Eating a little more and staying hydrated may also help with the dizziness. Best wishes! I took adderall for ADD but never lost weight and so I switched to phentermine. The Adderall suppressed my appetite much better than the phentermine does so my question is, does phentermine do anything other than suppressing a persons appetite to aid in weight loss? Because if it doesn’t and adderall is a better than I might as well stop taking the phentermine. Phentermine has been designed and is prescribed specifically for weight loss. However, not everyone reacts to it the same way. If you feel your prescribed phentermine is not working out for you, consult with your prescribing doctor. He could suggest a different dosage or based on your experience, take you off the medication. Hi Kris! The effects of phentermine are often strongest when you first start the medication, so it’s common to have a lot of dry mouth and not much appetite in the first few days. Still, if any side effects bother you or interfere with your daily life, definitely talk with your doctor to see if he/she can help!